In 2007, the US Air Force developed a manual called the ‘Cost Risk and Uncertainty Analysis Handbook’ in which various Monte Carlo simulation modelling techniques were described. It illustrated these techniques in a model estimating the cost of developing and manufacturing of a fictitious missile system, which we have reproduced. The Random sample column simulates each variable, and the Point estimate column shows the single values estimate for comparison. The Distribution column writes out in full the distribution that was used, using Object functions, which are then sampled in the Random sample column. We could have simply used random sampling distributions, e.g. VoseUniform instead of VoseUniformObject referenced by VoseSimulate, but this way one can review all the distribution parameters much better, which could be important as many of those parameters are the results of calculations and would not otherwise be visible. The original model used rank order correlation as correlation using copulas (ModelRisk did not appear until 2009, introducing the more advanced copula correlation method). The Normal copula used in the model provides the same correlation pattern. The model is set up to run two simulations: with and without correlation. When run with correlation, the distributions are sampled using the Normal copula. When run without correlation, the distributions are sampled using random numbers. The VoseSimTable function in cell O6 makes the switch between each simulation run. 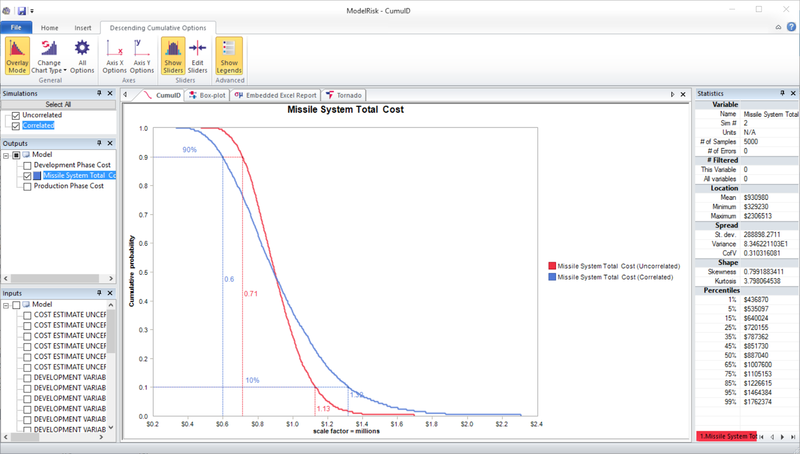 Extra levels of correlation are created between costs in several ways. Two types of factors are used, schedule/technical penalty factors and cost estimate uncertainty factors, which are themselves correlated, and which then multiply up cost estimates. In addition, the cost estimates for some parts are based on the simulated total cost for the air vehicle, creating a dependency relationship. These correlation methods, i.e. explicitly using common factors or making one cost a function of another, are very good practice, and tend to produce more realistic estimate than correlation matrices – as well as being easier to understand. The A1:A5 reference is simply to get the numbers 1:5. If one edited the model to add cells between A1 and A5, the logic would be messed up, so it would be better to make the reference OtherSheet!A1:A5 and hide sheet OtherSheet, but we didn’t because hiding sheets is not appropriate for example models. Another ‘trick’ is that the array N8:N37, where there are samples from Uniform(0,1) distributions, is entered as a single array function – done by selecting the range of cells, typing ‘=VoseUniform(0,1)’ and then CTRL-SHIFT-ENTER. 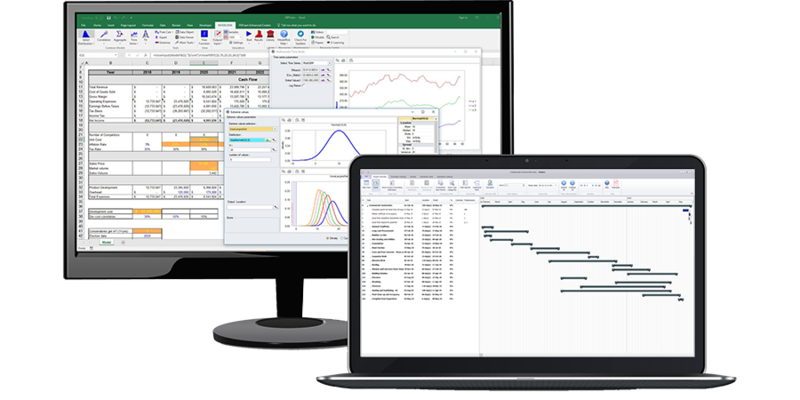 ModelRisk then generates independent random samples across the array. It isn’t necessary here, but it illustrates a useful ability for generating many samples from the same distribution within your spreadsheet because such array function simulate very fast. The model takes about 10 seconds to run 5,000 samples for each scenario. 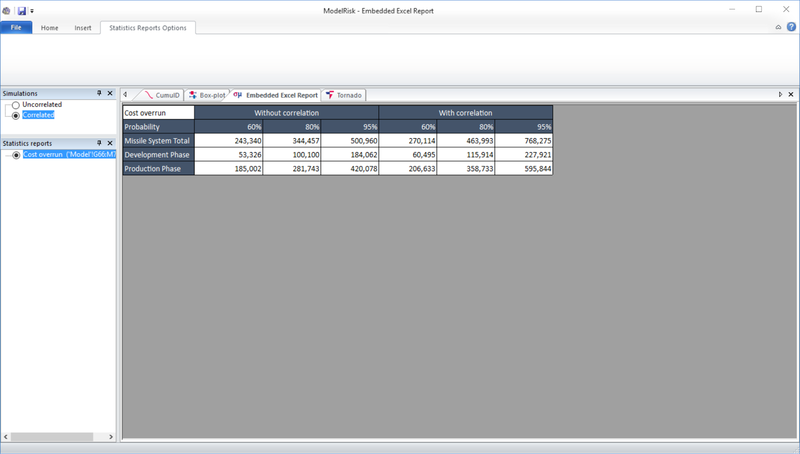 It is set up to directly show a number of reports within the ModelRisk ResultsViewer at the end of the simulation, which are described below. 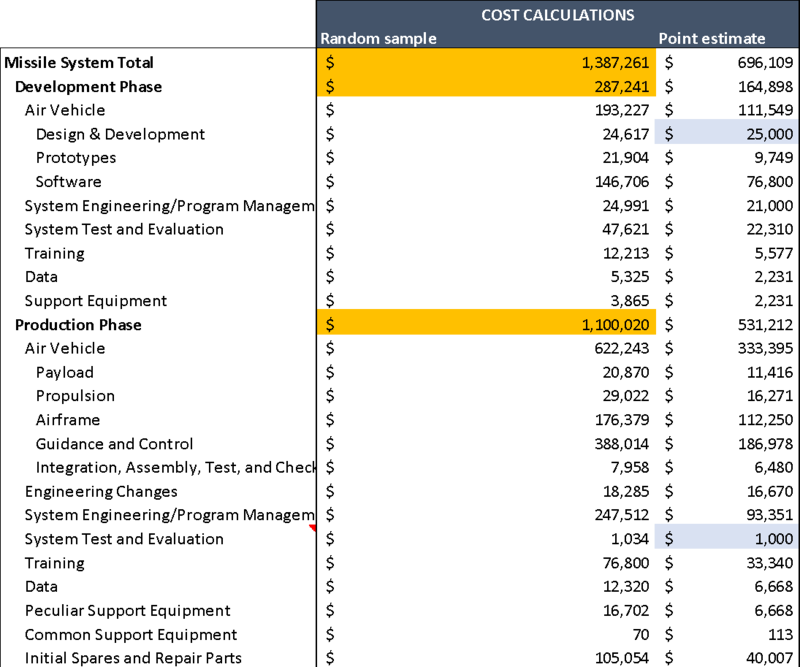 This plot illustrates how adding the correlation matrix has broadened the distribution of estimated cost so that, for example, it is estimated that there is a 10% probability the cost will exceed $1.32 million with correlation, but if correlation was ignored the estimate would be $1.13 million. 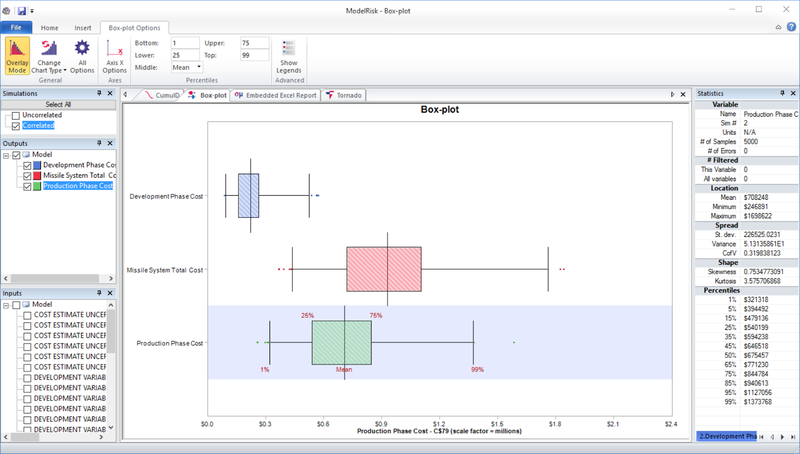 Box plots provide a useful way of comparing the distributions of several variables together. For example, it shows that the production cost contributes considerably more uncertainty to the total than the development cost. which is one way of measuring the variation of an output variable (the difference between the 10th and 90th percentiles) in proportion to its median value (P50). 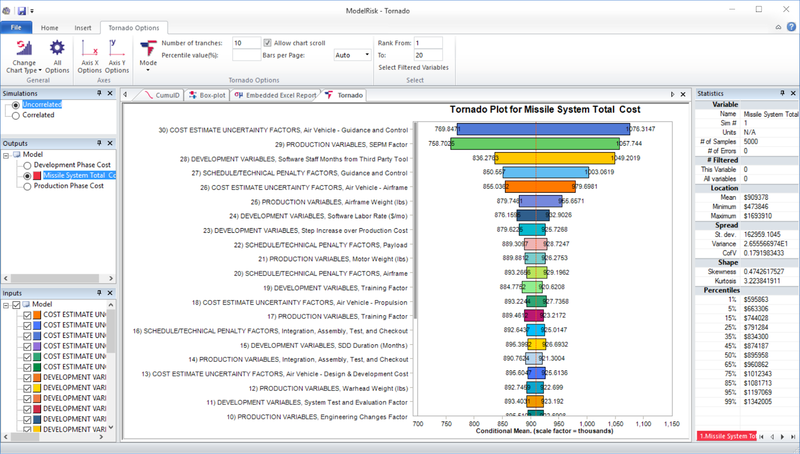 The various VoseSimXxx functions allow you to create virtually any statistic you might be interested in, which can then be added to your report. It illustrates, for example, that the total cost is most sensitive to the Air Vehicle – Guidance and Control uncertainty factor. It shows that the total average cost varies from $769k to $1.064M depending on whether this uncertainty factor is low or high. In a real problem, one would look at the most influential variables and consider how one could narrow their range and thus have a more precise estimate of the total cost.